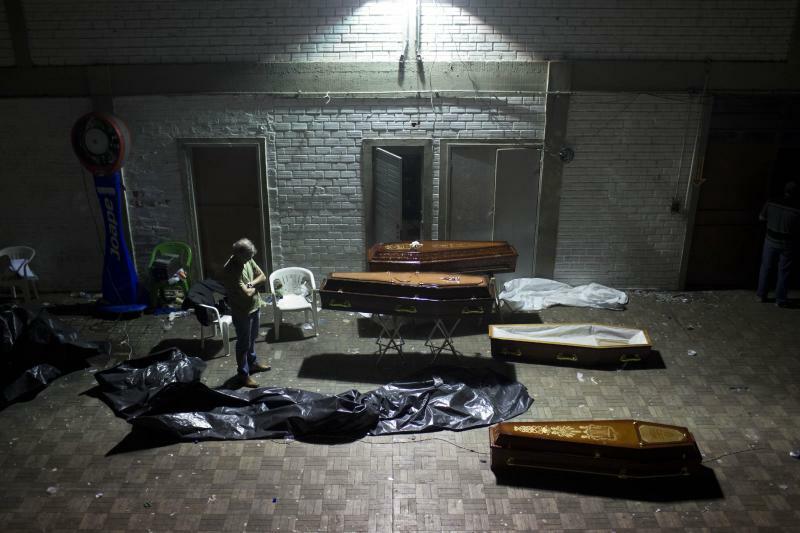 RIO DE JANEIRO (AP) — Never again, officials vowed a year ago, would Brazil see a horror like the nightclub fire that killed 242 young men and women, all suffocated by toxic smoke that filled a windowless bunker of a building with no emergency exits. Yet as Brazil marks the anniversary Monday of the deadly blaze at the Kiss nightclub, almost nothing concrete has been done at any level of government to improve fire safety or improve enforcement of existing fire codes across the country. That's stoking fears that another tragedy awaits, especially as tourists and locals pack clubs during the World Cup football tournament starting in June, a tournament being held in 12 far-flung cities. "What killed those kids at that nightclub was our culture, a culture of not liking to obey laws," said Luciano Favero, a fire prevention specialist based in Rio Grande do Sul state, where the Kiss fire occurred. "Brazil is a country that reacts; it does not prevent." It was about 2:30 a.m. on Jan. 27, 2013, when soundproofing foam on the ceiling caught fire in the overcrowded nightclub in the university town of Santa Maria. The lead singer of a country band onstage had lit a flare as part of an illegal indoor pyrotechnics show, sparking the blaze. Investigators said the burning foam released cyanide, carbon monoxide and carbon dioxide that quickly killed those attending a university party. Scores of bodies were piled in twisted knots inside the club as hundreds stampeded through darkness, trying to reach a single row of four doors that served as both entry and exit. Aside from the dead, 630 people were injured, and about 90 of them still face grave health problems from smoke inhalation. Despite an investigation that said the fumes from the flammable soundproofing foam caused the deaths, officials say that even it remains legal. A day after the fire, President Dilma Rousseff presided over a previously scheduled meeting of new mayors from across Brazil, where she told them about the "indescribable pain" she witnessed upon visiting with victims' families just hours after the blaze. "I speak of that pain to remind all of us with executive powers of the responsibilities we have toward our population," Rousseff said. "In the face of this tragedy, we have the duty to make the commitment, to ensure that this will never happen again." The president's words resulted in nothing, said Rodrigo Tavares, a private engineer and fire-safety consultant in Brazil. "At first, we had this national uproar and many plans to make changes," Tavares said. "However, in practical terms, the situation of security and fire protection remains the same." What Tavares and other experts agree is the single most important step needed is the passage of a national fire safety code to impose and enforce the same standards across Brazil. The Santa Maria blaze exposed deep flaws in Brazil's system, which gives states the right to determine their own fire codes and cities the power to enforce them and hand out operating permits. That leaves the much of country at the mercy of poorly trained and overtaxed inspectors working in a system with widespread corruption, where a bribe is an easy way around inspections and enforcement of existing codes is haphazard. Congressman Paulo Pimenta, a member of the governing Workers Party who is from Santa Maria, has tried unsuccessfully to push a national fire safety code through Congress during the past year. He says a bill hasn't passed because leaders quickly forgot about the blaze and turned to other matters as the sting of the tragedy faded. Pimenta's bill would force buildings to install more emergency exits, which are rarely used in many parts of Brazil, and ensure that materials like the soundproofing in the Kiss club are non-flammable and approved by government regulators. His bill would also make it easier to hold local officials accountable for approving inadequate fire plans for clubs, hotels and other establishments. Both the Santa Maria mayor's office and fire department say they've stepped up inspections in the city, but that they're waiting on the state legislature or national congress to put into action any stiffer safety demands. Since the Kiss nightclub fire, its two owners and two band members blamed for starting the fire face homicide charges, but are free pending trial. A guilty verdict could bring a prison sentence of up to 30 years, although the complexity of Brazil's legal system and the ability to present numerous appeals means several years can elapse before someone convicted of a crime is put behind bars. State prosecutors say four other people face lesser charges related to false testimony and falsified documents. Five firefighters face trial in a military court on negligence charges, while three are accused of falsifying public documents related to the club's fire permit. Despite the charges, many in Santa Maria fear nobody will be held accountable. "Justice hasn't been done, and until it is this culture of impunity will win out. Nobody will have learned any lessons because nobody will be punished," said Douglas Medeiros, a university student whose 18-year-old girlfriend, Thanise Correa Garcia, died in the fire. "Here in Santa Maria, there have been no changes to the law, nothing that would force officials to feel compelled to really take action."